I hate to admit when I am wrong, but I was wrong about everything because my dogma clouded my judgement. I have always been an Apple fan boy, and I always thought drinking butter was bad. Davey Nelson showed me the way of the Android Operating System on top of putting sticks of butter into my morning coffee. I have always balked at the idea of a non iOS phone, and the prospect of bulletproofing my coffee, but here I am on my Galaxy S8 and sipping on hot buttered coffee. I am a true believer now! I went ahead and let my Apple Fanboy side of me die. When they started offering 3x points on Mobile Wallet on my US Bank Altitude Card, I knew there was many churning opportunities out there with MSing with in store gift cards and daily spend. With each point worth 1.5 cents we are looking at 3x points for 4.5% cash back for travel on every swipe transaction. This is almost twice that of the USAA 2.5% Limitless card. I tried to earn 3x points with Apple pay, but sadly the terminals are not as prevalent as I want. Samsung has acquired LoopPay which is a powerful induction coil that would emulate a card swipe. If you hold the Galaxy s8 next to a CRT and try to “pay” you can see how strong this thing is. Getting the Samsung s8 means that I can use Mobile Wallet at any location that would take magnetic swipe cards. I even had this exact situation happen at a Chinese restaurant where the cashier could not believe it would work. You just hold the phone next to the swiper and the terminal thinks a card has been “swiped”. Yes the Samsung U960 Rogue Verizon is an eligible trade in. If the iPhone 4 was a locked Verizon phone then it would be an eligible trade in. Subject to these Terms, you may trade in your eligible Samsung smartphone (“Trade-in Device”) and receive a credit from Samsung to use toward the purchase of a new Galaxy S8 or S8+. This Trade-In Program is only available for Galaxy S8 or S8+ smartphones purchased online directly from Samsung via Samsung’s website at www.samsung.com. 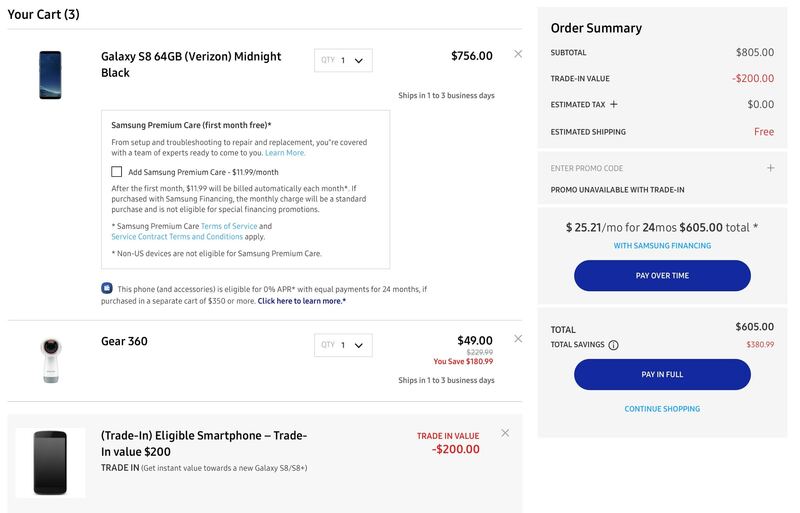 When you place your order, Samsung’s website will display a Trade-In Value based on the particular model device you select as your Trade-in Device. The Trade-In Value displayed is subject to receipt by Samsung of your Trade-in Device, in good condition as provided in these Terms. You may incur additional charges if you do not send your Trade-In Device to Samsung within fifteen (15) days of receiving your new device or if your Trade-In Device is not in good condition. See Sections 4 and 5 below for further details. When you complete your order, Samsung will ship your new Galaxy S8 or S8+ to you. You should activate your new device and transfer your data, contacts, etc., before you ship your Trade-In Device to us. You can transfer your information from the Trade-In Device to your new device using Samsung Cloud, a data cable, or any of the other methods described in the documentation that accompanies your new device. You must then ship your Trade-In Device to Samsung. Samsung will provide a shipping label and instructions to send us your Trade-In Device. You must follow the instructions Samsung provides, including using any traceable shipment method required by Samsung. If you lose or discard the shipping label, please contact us. Your Trade-In Device must be returned within fifteen (15) days after the date you receive your new Galaxy S8 or Galaxy S8+ under the Trade-In Program. Samsung will consider your Trade-In Device received as of the date you give it to Samsung’s authorized shipping provider with the prepaid return label Samsung sent you. By shipping the device to Samsung, you agree to transfer title and ownership of the device to Samsung. You disclaim any and all right, title or interest in and to the Trade-In Device, including the right to sell, dispose, or otherwise collect, where applicable, the its value. You should ship only the Trade-In Device to Samsung. Discard accessories you no longer need in accordance with your local trash and recycling regulations. No trade in value is offered on anything other than your Trade-In Device itself. If you have any further questions or concerns, please email us back or contact our customer service department at 1-855-726-8721 and hit number “1”. We are open seven days a week between the hours of 9am-9pm EST. One of our friendly agents will be more then happy to assist you. The total cost of the new phone was $556 (inclusive of the $200 rebate) of which I needed to spend towards my Minimum Spend anyways. I would need to spend $12,355.55 in order to pay off the phone in terms of 4.5% cash back which is a silly way to justify the purchase. If you can get you hands on a used compatible phone you can connect via wifi to your existing phone to use the service. What was nice is on top of the 3x Altitude points you can earn Samsung Pay points for using the service. Right now they have an offer of 2,500 Samsung points for using Samsung Pay on your new S8 or S8+. On top of that if you use http://smsng.us/payreferral and enter my code 74730E before your 1st purchase to get $5 in rewards. When you sign up you get 4x point as platinum right off the bat. Which means 10 points x 4 for every purchase using Samsung Pay. Redemption is alright, it takes 20,000 points for a $100 gift card (500 swipes). With the 2,500 free points you get after 10 swipes you can at least get $10 Toys’r’us gift card. Again not a rocking good deal, but something on top of using you Samsung Phone. So if you plan on maximizing your 3x points with the USB Altitude the Samsung Pay is the way to do it. Just icing on the cake when you get the Samsung Points as well. Good luck out there trying to explain to everyone that the induction coil is different than Apple Pay, you will get a lot of resistance at first.